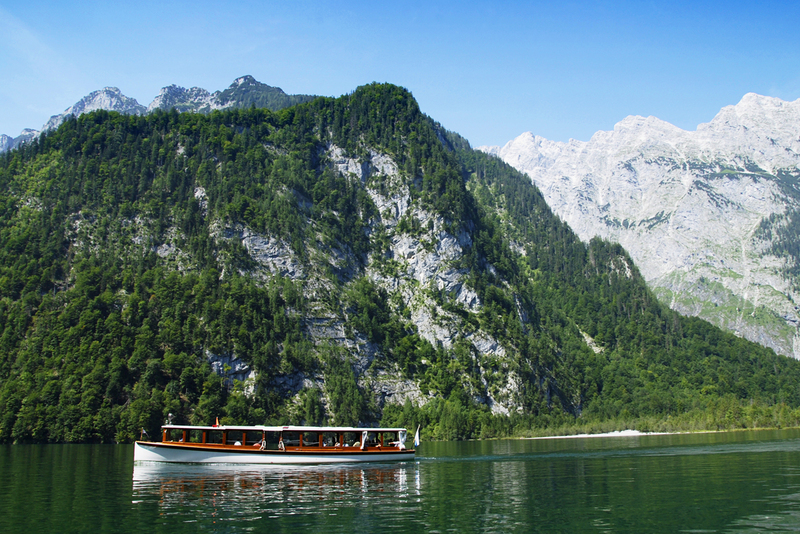 Take a boat tour across Lake Königssee: For a truly memorable Salzburg experience you can’t miss Lake Königssee, just an hour by bus from the city. Admittedly the lake is no secret to tourists but given the views are among the most spectacular in the area, it’d be remiss of us to not mention it. Boat tours give you the opportunity to take in 360-degree views of the fairytale setting, with crystal clear water framed on all sides by snow-capped peaks. The boat trip itself takes a little over an hour, but you can hop off halfway St Bartholomä to explore the lush mountainside with a secluded church. Watch an ice hockey match: Austrians are fiercely proud of their local ice hockey teams; at any match you’re bound to see more brawls than pretzels. In peak season some 3000 Austrians pack out the Salzburger Eisarena to watch each game, while the energy of the heaving crowd is infectious – it seems whacking pucks really brings locals together. Grab a hot pretzel, a cup of mulled wine, and cheer for the Red Bull Salzburg: you’ll fit right in. Sample Mozartkugel: Have a break from Austria’s widespread Sacher torte dessert with a more local delicacy; Salzburger Mozartkugel. 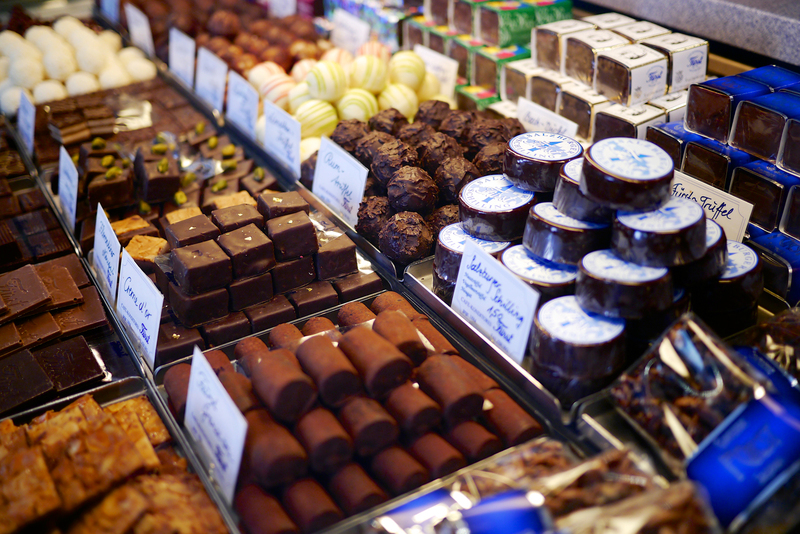 This sweet treat made of chocolate, marzipan and nougat was invented by Paul Fürst in Salzburg in 1890, but his legacy continues today with each chocolate made by hand and sold only within Salzburg. The Salzburgers are so proud of their hometown’s handcrafted creations that in 2008 a series of giant Mozartkugelns were placed around the city, some towering three stories high. Fortunately for Austrian waistlines, these weren’t edible. Hop into a thermal spa: All too many visitors to Salzburg are so taken by the towering peaks and alpine views across the area that they miss the fact that underneath it all lies a system of hot springs. Bad Hofgastein village is situated just south of Salzburg and is home to a number of thermal spas that make for an idyllic retreat from Salzburg’s chilly climate. 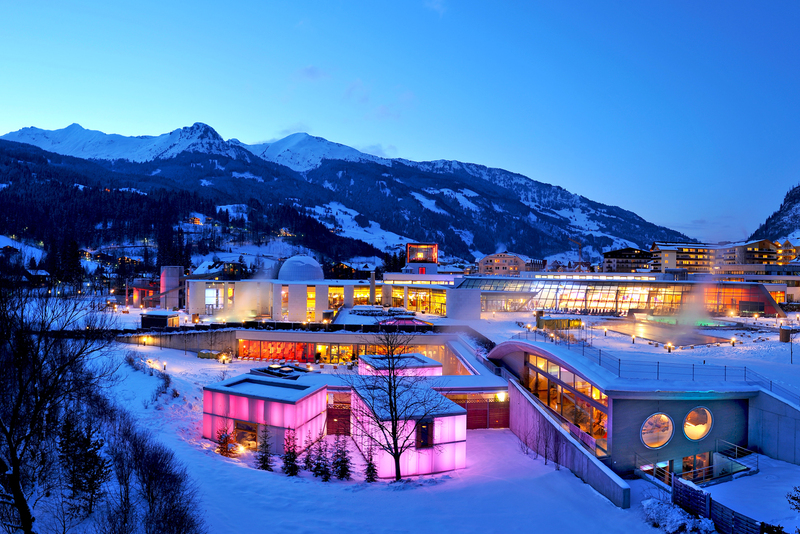 Here you can make like a local and lounge in the outdoor thermal spas, surrounded by the towering Gastein mountain range. Some believe that the water contains healing properties but we’re just a fan of how it reenergises any weary traveller. Perched on the border between Austria and Germany lies the city of Salzburg, made famous as the setting of The Sound of Music. But beyond the castles, cathedrals and rolling hills, this alpine town is home to a range of unique experiences, many of which travellers miss says Elizabeth Abbott. Austrians are fiercely proud of their local ice hockey teams; at any match you’re bound to see more brawls than pretzels. In peak season some 3000 Austrians pack out the Salzburger Eisarena to watch each game, while the energy of the heaving crowd is infectious – it seems whacking pucks really brings locals together. Grab a hot pretzel, a cup of mulled wine, and cheer for the Red Bull Salzburg: you’ll fit right in. Hot tip: The ice hockey season runs throughout winter. Check for details of upcoming matches online. Red Bull’s Hangar 7 museum is undoubtedly a must see for car and aviation enthusiasts alike (stick with us, it gets better), with exhibitions and air shows by the Flying Bulls. But for the less auto-inclined, it’s also a surprising haven for foodies with an array of bars and cafes, plus the Michelin-starred restaurant Ikarus, featuring a different renowned guest chef each month. Previous guest chefs have included French actor and celeb chef Gérard Depardieu and Middle Eastern cuisine maestro Greg Malouf, formerly of Melbourne’s MoMo. There’s also impressive art displays and architectural feats to take in too. 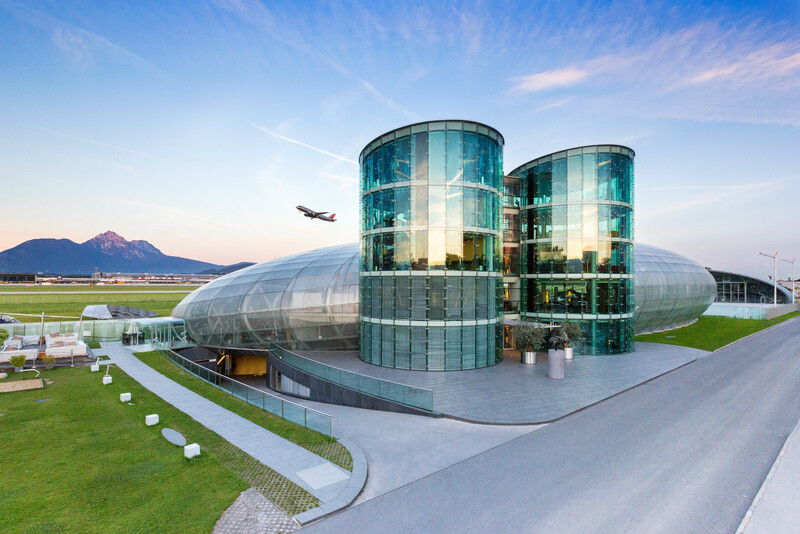 Hot tip: Thanks to its glass-covered design, Hangar 7 also boasts some of the best views of Salzburg with panoramic vistas across the mountains. Have a break from Austria’s widespread Sacher torte dessert with a more local delicacy; Salzburger Mozartkugel. This sweet treat made of chocolate, marzipan and nougat was invented by Paul Fürst in Salzburg in 1890, but his legacy continues today with each chocolate made by hand and sold only within Salzburg. The Salzburgers are so proud of their hometown’s handcrafted creations that in 2008 a series of giant Mozartkugelns were placed around the city, some towering three stories high. Fortunately for Austrian waistlines, these weren’t edible. Hot tip: Try the original Salzburger Mozartkugel at Café Konditorei Fürst in the Old City. For an even more indulgent treat try the Doppler Koneffekt featuring champagne truffle. All too many visitors to Salzburg are so taken by the towering peaks and alpine views across the area that they miss the fact that underneath it all lies a system of hot springs. Bad Hofgastein village is situated just south of Salzburg and is home to a number of thermal spas that make for an idyllic retreat from Salzburg’s chilly climate. Here you can make like a local and lounge in the outdoor thermal spas, surrounded by the towering Gastein mountain range. Some believe that the water contains healing properties but we’re just a fan of how it reenergises any weary traveller. Hot tip: Spend your morning trekking through the neighbouring national park, Hohe Tauern, before heading into Alpentherme Gastein to unwind. For a truly memorable Salzburg experience you can’t miss Lake Königssee, just an hour by bus from the city. Admittedly the lake is no secret to tourists but given the views are among the most spectacular in the area, it’d be remiss of us to not mention it. Boat tours give you the opportunity to take in 360-degree views of the fairytale setting, with crystal clear water framed on all sides by snow-capped peaks. The boat trip itself takes a little over an hour, but you can hop off halfway St Bartholomä to explore the lush mountainside with a secluded church. Hot tip: Make sure you have plenty of space on your camera’s memory card! The verdict is in: This is the best ski resort in the world!